Vacancies available. Call only from 8.00 to 21.00. Spend your holiday in Villa Józefina – 1500 m from the centre, we still have the last vacant rooms. We offer clean rooms featuring very good standard, with bathrooms, TV, Internet access, and parking. A small object providing for intimacy. Convenient location. Detailed information and price list is arranged on the telephone for each booking. The price also depends on the selected standard of the room. The object is exceptional due to the large garden around it with a stylish regional shelter with a barbecue, open only in summer. Playground, sway, trampoline, sandbox only in summer. A large parking lot available in the premises, locked by night for the safety of our Guests. Shared terrace equipped with tables and loungers. All this in Zakopane 1500 m from the railway and bus station. 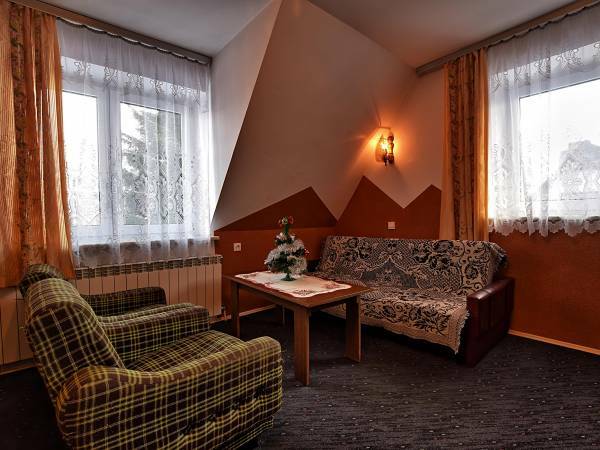 The area offers (30 m from the house) a grocery store, bus, tavern (menu of the day for 13.90 PLN, breakfast from 10 PLN), bus, ski complex Harenda 1300 m.
1. Apartments (for 2, 3, 4, and 5 persons). They feature two rooms, a spacious bathroom, and kitchenette (refrigerator, microwave, kettle, dishes, induction stove). Independent entrance. Price 50-60 PLN. 2. Rooms with bathrooms (for 1, 2, and 3 persons). 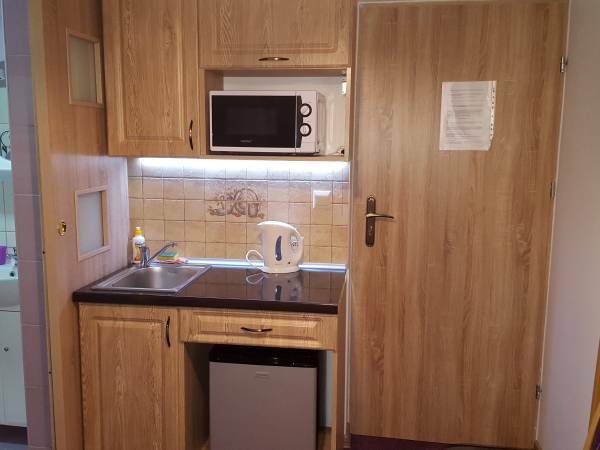 A shared kitchenette in the corridor (refrigerator, microwave, kettle, dishes), lounge area, smoking room. Two rooms come with a shared terrace. We also offer rooms in the attic and on the first floor. Price 35-40 PLN. 3. High standard studios (for 2, 3 persons). New comfortable rooms with bathrooms and kitchenettes (refrigerator, microwave, kettle, sink, ceramic dishes). Most of them come with balconies. Higher standard of facilities. Price 45-50 PLN. 4. For families we recommend family studio apartments (for 4-8 persons). One of them features two rooms, a hall, and large bathroom, a private mini kitchenette ion the hall (refrigerator, microwave, kettle, dishes, induction stove), and the other featuring two rooms, a kitchenette (refrigerator, microwave, kettle, dishes, induction stove), hall, and bathroom. Price 40-45 PLN. The kitchenettes do not have a gas stove – only an induction stove. Induction stove only in apartments and family studios. accommodation, bed linens, tourist tax. We do not provide towels! Free parking is available, fenced and locked by night. Check-in (in high season) from 14.00 (off season you can arrive earlier based on prior arrangement). We do not provide baggage storage. Customer service from 8.00 to 20.00 (later only on the telephone). The price list is not valid during the long weekend in May, August, and on the New Year’s Eve! The price depends on: the type of room, stay duration, number of persons in a room, and standard of the room. 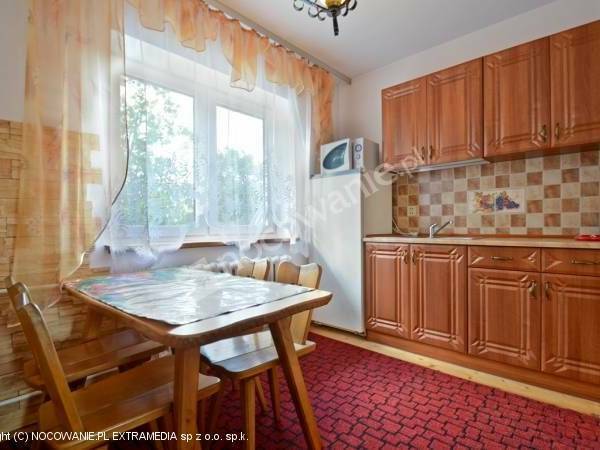 Minimum price 35 zł concerns studios for 6-8 persons and double rooms in the attic. Stay for a single night – more expensive!